Our Merchiston campus is well-served by public transport to and from the centre of the city. In addition, there are numerous cycle paths in the area and bike storage facilities on site. Service 45 from the city centre stops at bus stop “Napier University (SW)” opposite the campus. Services 11, 15, 16, 23, 36 and 45 from the city centre stop at bus stop “Holy Corner (S)” on nearby Bruntsfield Place. Service 5 from the city centre stops at bus stop “Churchill (S)” on nearby Morningside Road. Edinburgh boasts a very efficient network of environmentally friendly buses that will take you all across the city and out to the suburbs. All our campuses are served by Lothian Buses offers for a flat-rate fare throughout the city, making getting to university cheap and easy. What’s more, full-time students are also eligible for a Student Ridacard offering discounted travel. While there is no direct bus service from Edinburgh Airport to the campus, you can easily take Service 100 from the airport (Stance D) to “Shandwick Place”, walk one minute to “Queensferry” (Stop QB), and take Service 36 to “Holy Corner”. Merchiston campus is just a five minute walk along Colinton Road and Merchiston Avenue. A Transport for Edinburgh app is available free for smartphones and offers live bus information and electronic ticketing. Edinburgh Waverley and Haymarket are situated in the city centre. 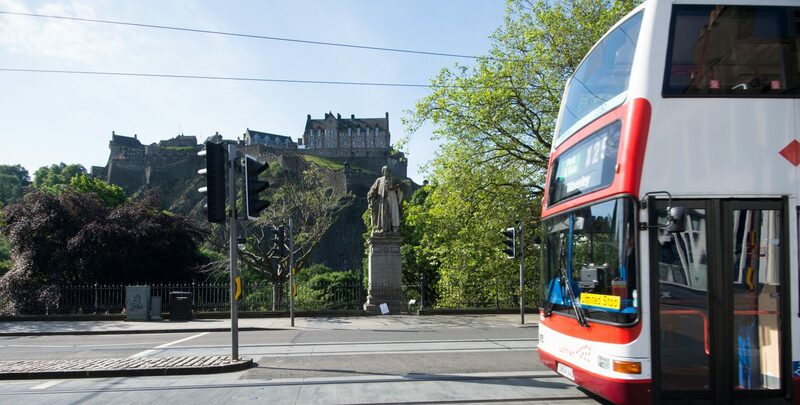 From Edinburgh Waverley, take a Lothian Buses 10, 11, 15, 16 or 23 from Princes Street; from Haymarket, there are no direct bus services to the campus but Lothian Buses 12, 26 and 31 will easily connect you to services 10, 11, 15, 16 or 23 at Lothian Road. Timetables and further information on rail services can be found through National Rail Enquires. Edinburgh is home to an expanding network of cycle paths and covered and secure bike storage as well as shower facilities are available at the campus. The City of Edinburgh Council publishes useful information on planning cycle routes within the city. The campus is situated in a residential area to the south-west of the city. Please note that on-campus parking is strictly by permit only, with limited on-street parking available in the surrounding area. For a detailed access guide to our Merchiston campus, please visit here. For a detailed guide to accessing our dedicated music department and building within Merchiston itself, please visit here.